When I heard that Berkeley Breathed was making the jump to novels, I was tickled. I have been a huge fan of Breathed's work for years, back when he was doing the newspaper strip Bloom County. I have followed his characters over the years, from Bloom County to Outland and finally on to Opus. I have picked up his childrens books and am now anxiously awaiting the release of the first volume in a collected edition of his Bloom County newspaper strips. When I heard about Flawed Dogs, the Novel, I assumed that it was simply an extension of his children's book Flawed Dogs: The Year End Leftovers at the Piddleton "Last Chance" Dog Pound, maybe telling the story of the riot at Westminster that was mentioned in the book. 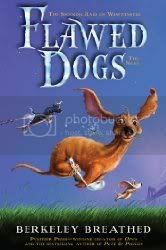 While this is partly true, basically Flawed Dogs, the Novel takes a mirror image of the original story, using characters from the original (mostly the dogs), and slightly altering others (Heidy Strüdelberg, former Westminster judge becomes Heidy McCloud, young niece to Hamish McCloud, owner of McCloud Heavenly Acres, and a famous dog shower in his own time), to make an entirely new and refreshing story of the love between a dog and their human. I firmly believe in the idea that there are "dog people" and "not dog people" out there; dog people have a dog and will understand what this story is all about. Not dog people simply won't get beyond that it's a fun little story. The story revolves around Heidy McCloud and her dachshund, Sam the Lion. Sam is going to be a show dog, living only to make his owner happy. Heidy McCloud is an orphan who has been sent to live with her reclusive uncle Hamish McCloud. Through a chance encounter at the airport, Heidy and Sam become best friends (this chance encounter results in a taxiing 737 following Sam driving an electric airport cart who is following Heidy in a cab - trust me, in Berkeley Breathed's world, this works). Heidy and Sam make themselves a new home with her Uncle Hamish, secure in the knowledge that Heidy has found her dog and that Sam has found his human. However, Sam eventually is framed by the housekeeper's poodle, Cassius, when it becomes clear to Cassius that Sam will win Best in Show at the next Westminster Dog Show, a prize that Cassius feels has every right to go to him. Uncle Hamish sends Sam away after he has been framed, and Sam eventually winds up at the Naional Last-Ditch Dog Depository, a dog pound for the mot unloved, un-adoptable dogs. Sam decides that this is not the place for him, decides to leave, knowing that if he could make it back to Heidy, he could make her understand what has happened. When he reaches the McCloud estate, Cassius heads him off, and Sam finally understands that it was Cassius who framed him. Sam is injured in a scuffle with Cassius, and is left to die when he is found and sold the New England University Research Labs. After several years imprisoned there, Sam organizes a mass breakout with all the other animals kept there. He then finds himself living with the Rough Handed Man, who has a kind heart but is in need of money and enters Sam into a dog fighting contest for money. It is here that Sam sees the poster for the upcoming Westminster Dog Show, with Cassius' picture prominently displayed, and it is here that Sam realizes that Cassius is to blame for his years of torment. He escapes the dog fights, returns to the Dog Depository, convinces the other dogs there that they must help him overthrow the Westminster and take revenge on all the other perfect, pampered dogs in the world. This is where the book really takes off. "...As the small curly-haired dog tried to regain traction, he slid around toward the rear, giving the full appearance to the observing crowd that below the coat, Mrs. Nutbush's left bosom had gone rogue and begun a migration to better shores. The club secretary watched this without expression beyond a single perfectly arched eyebrow. 'Madam,' he said, 'Your bits are restless.'" I kept having to go back and reread this bit, because it kept making me giggle each and every time. In continuing Breathed fashion, the story eventually loops right back around to become a touching story of friendship and the love between a dog and human, as Heidy and Sam are finally reunited. I am always surprised by how Berkeley Breathed is able to make something that can in turns be so ridiculous and funny and absurd, yet still bring it around to become a story that has true heart and soul. OMG i LUVED Flawed Dogs. It is one of my fav books. My dog just died so while i was reading it, i sobbed like a baby.